Newfoundland's snow-covered Great Northern Peninsula might be colder than much of the country, but there's plenty of warmth among its locals -- three of whom helped rescue a young moose trapped in the snow in Ship Cove, NL. Kathleen Tucker found the yearling moose lying on its side, stuck in a snowbank in her backyard, on Friday. Her husband, Leonard, and brother-in-law Robert, knew something had to be done. The moose was motionless when the group approached it, with its legs straight out and its back against a rock wall, Leonard recalls. "We looked at it, didn't see any injuries or anything like that -- didn't look like anything was broken, no blood or anything on the snow," he tells The Weather Network. "[H]e was motionless, as in, he couldn't get his balance or he couldn't get his leverage to right himself up," Leonard adds. "And you could tell he'd been there for a few hours because of the way the snow was swept around with his legs." Brothers Robert and Leonard then took to the snowbank with shovels to help free the moose. Soon enough, it picked itself up and made its way off. After the moose was free, the family followed it, only to find it had collapsed once more across the road. "He was totally exhausted again," Leonard said. "We called Wildlife and they advised us to keep an eye on him; that likely he had collapsed from exhaustion. Sure enough, an hour later he got up and trotted up the road." 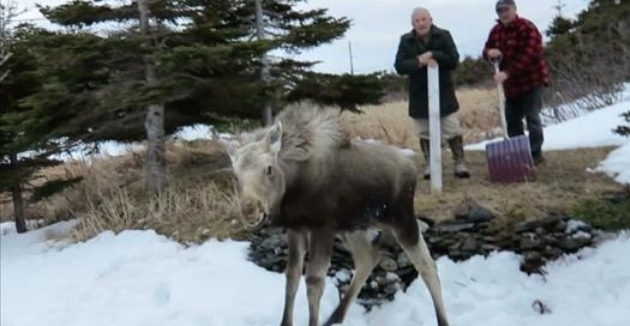 Responses to "Newfoundlanders' rescue of baby moose is inspiration to all"